New England Fabric Shower Curtain Diamond Weave Textured Stripes 70"x72"
PEVA Shower Curtain/Liner w/Magnets Solid Color 70" x 72"
Bath Rug, Non Skid Back, Soft Faux Fur - St. Lucia Prima 24" x 40"
Coordinates with the matching bath accessories, rug, towel set and shower curtain. Our mission is simple: to help you create the bedroom and bathroom of your dreams with the highest quality bed and bath accessories. The Veronica design creates a chic update for your modern bathroom. Coordinates with the matching bath accessories, rug, towel set and shower curtain. Our mission is simple: to help you create the bedroom and bathroom of your dreams with the highest quality bed and bath accessories. Set also includes a matching Hooks set. Coordinates with the matching bath accessories and rug and towel set. Shower Curtain Our mission is simple: to help you create the bedroom and bathroom of your dreams with the highest quality bed and bath accessories. Bring a sophisticated touch to your bathroom decor with the Popular Bath Madeline Beige Bath Collection shower curtain and hooks set. Featuring a hand crafted rose against a striped background on the machine washable material, the curtain is both stylish and durable. Pacey 100% Cotton Fabric Striped Shower Curtain 70" x 72"
Decorate your bathroom with the contemporary design of the Popular Bath Madeline Beige luxury bath accessory set. The set features a hand crafted rose against a striped background which enhances the appeal of the collection. With a Multi animal skin design in a checker board pattern, Zambia Bath accessories design are a beautiful and exotic update for your modern bathroom. Coordinates with our matching bath accessories, rug, towel set and shower curtain. 100% PEVA Heavyweight 8 Gauge Shower Curtain Liner 70"x72"
Zambia is a checker board animal print on Beige Bath Towels. A beautiful update for your modern bathroom. Popular Bath Zambia 3-Piece Towel Set. Includes: 1 Bath Towel, 1 Hand Towel and 1 Wash Cloth. Features for Soap Dish, Hooks, Tumbler, Lotion Pump, Tooth brush holder 1 Soap Dish. 1 Shower Curtain. Our mission is simple: to help you create the bedroom and bathroom of your dreams with the highest quality bed and bath accessories. 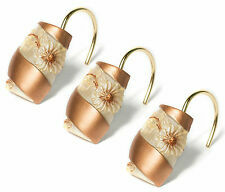 Decorate your bathroom with the contemporary design of the Popular bath Madeline Beige luxury bath accessory towel set. The hand crafted rose against a striped background adds an elegant touch to the cotton towels, which enhances the appeal of the collection. The Zambia Waste basket coordinates with matching bath accessories, rug, towel set and shower curtain. With a Multi animal skin design in a checker board pattern, Zambia Bath accessories design are a beautiful and exotic update for your modern bathroom. Bring a sophisticated touch to your bathroom decor with the Popular Bath Madeline Beige Bath Collection shower curtain and hooks set. Featuring a hand crafted rose against a striped background. Pattern: Madeline. The Veronica Fabric Shower Curtain is adorned white with floral striped design bands in Beige. Coordinates with the matching bath accessoriesand rug and towel set. Fabric shower curtain with multi print stripes. A beautiful update for your modern bathroom. Mrimar Bath and Contour rug set Coordinates with our matching bath accessories, towel set and shower curtain. Contour rug - 21 x 24. Bath Rug - 21 x 32. Our mission is simple: to help you create the bedroom and bathroom of your dreams with the highest quality bed and bath accessories. The Zambia Tissue Box coordinates with matching bath accessories, rug, towel set and shower curtain. With a Multi animal skin design in a checker board pattern, Zambia Bath accessories design are a beautiful and exotic update for your modern bathroom. The Zambia lotion pump coordinates with matching bath accessories, rug, towel set and shower curtain. With a Multi animal skin design in a checker board pattern, Zambia Bath accessories design are a beautiful and exotic update for your modern bathroom. The Zambia Tooth brush holder coordinates with matching bath accessories, rug, towel set and shower curtain. With a Multi animal skin design in a checker board pattern, Zambia Bath accessories design are a beautiful and exotic update for your modern bathroom. Zambia is a checker board animal print band on an Beige color contour Bath rug. A beautiful update for your modern bathroom. Coordinates with our matching bath accessories, towel set and shower curtain. A beautiful update for your modern bathroom. Coordinates with our matching bath accessories, towel set and shower curtain. Contour rug - 21 x 24. Our mission is simple: to help you create the bedroom and bathroom of your dreams with the highest quality bed and bath accessories. Decorate your bathroom with the contemporary design of this Popular Bath Shells & Diamonds Collection luxury bathroom Soap Dish. 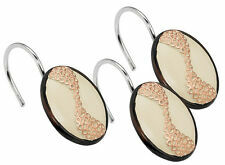 The set features shells and diamonds in a beige finish which enhances the appeal of the collection. 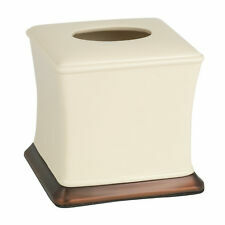 Decorate your bathroom with the contemporary design of the Popular Bath Madeline Beige luxury bath accessory Soapdish. It features a hand crafted rose against a striped background which enhances the appeal of the collection. A beautiful update for your modern bathroom. Coordinates with our matching bath accessories, towel set and shower curtain. Bath Rug - 21 x 32. Our mission is simple: to help you create the bedroom and bathroom of your dreams with the highest quality bed and bath accessories. The Popular Bath Madeline Beige Bath Collection Bath Rug has a hand crafted rose against a striped background for the perfect look. Pattern: Madeline. Bath Rug Backing: Non-skid Rubber. Bath Rug: 21" x 32". Contour Rug for bathroom--around toilet area. Bath Fashion. 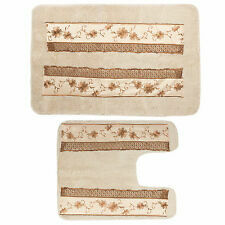 Veronica Banded Bath Rug is white with floral striped design bands in Beige. The Veronica design is a beautiful update for your modern bathroom. Coordinates with our matching bath accessories, towel set and shower curtain. A beautiful update for your modern bathroom. Coordinates with our matching bath accessories, towel set and shower curtain. Contour rug - 21 x 24. Bath Rug - 21 x 32. Our mission is simple: to help you create the bedroom and bathroom of your dreams with the highest quality bed and bath accessories. 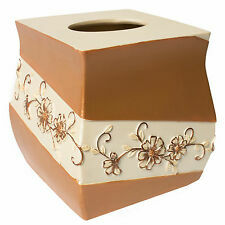 Decorate your bathroom with the contemporary design of the Popular Bath Madeline Beige luxury bath accessory Waste Basket. It features a hand crafted rose against a striped background which enhances the appeal of the collection.